Finally we got the wind to coincide with our weekly Wednesday night PRIMI Naish Downwind Dash – we’ve been doing 4-5 social downwinds a week for the month of November, but with no wind on Wednesdays it means this was the first race since October 23rd! It was for this reason fitting that the Cape Doctor blew properly, with wind gusts up to 35knots and that a solid swell added some flavour to proceedings. First start saw all, but Grant Donald, get drilled, as wave after wave tore into the field with some spectacular wipeouts supplying entertainment for the crowds on the beach. Eventually, everyone got through and then it was the second start with Dylan Frick and Chris Bertish shooting out of the blocks – both made it to the backline without having to tackle one single whitewater whereas most others had some 3ft whitewater obstacles to clear. Ivan van Vuuren also negotiated the mine-field with aplomb and set off with a nice lead on the pursuit teams. One of the losers in this batch was Joshua Robertson who took a couple on the head. Once out the back the wind was honking with several runs being mounted without any paddle effort whatsoever – brilliant cricket! Ethan Koopmans once again seemed to slack off at the start and suddenly had a lot of work to do with Dylan and Chris having gotten a couple of hundred meters clear of everyone within minutes. 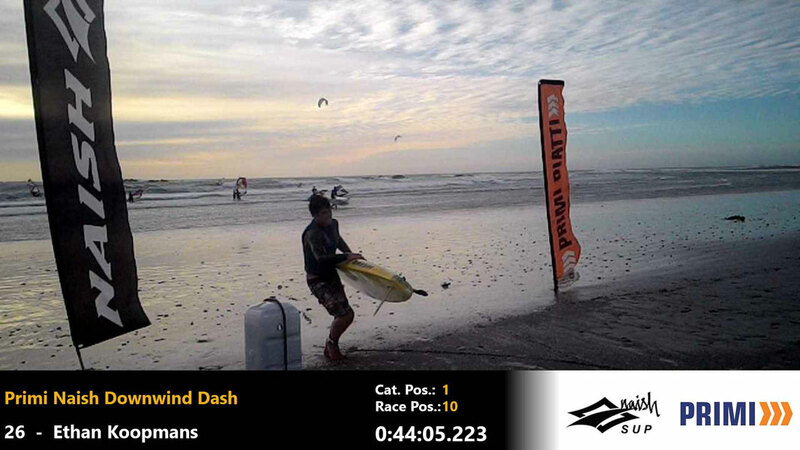 The youngster dug deep, and by halfway, Ethan had caught up to the leading pair, setting the race up for a great finish. Ethan displayed his newfound class by eventually clearing the boys by a minute and riding a wave casually from the back to the beach to take his second successive win. Ethan’s time of 44.05 was only a minute shy of the course record and if it hadn’t been for the slowish start and a trip, resulting in a full board and body cartwheel on the run up to the finish, he may even have cracked it! Chris and Dylan were neck and neck the entire way with Dylan having pulled 30m on Chris coming into Small Bay. This prompted Chris to gamble on the Big Bay entry and the chance of a set wave…as it were, none were forthcoming and Chris had to settle for 3rd with Dylan taking out a fine 2nd. Ivan van Vuuren capitalized on his great start and took a solid outside line which kept him in contention and eventually gave him 4th (and first Master) ahead of Greg Bertish in 5th. Kim Duvenage took 3rd in the ladies division and closed off the field and while the top two ladies had another cracker with less than a minute separating them – both got punished at the start but out on the runs it was young Mishka Steyn who just managed to edge ahead of Brigette van Aswegen – great to see such close racing! The juniors, however, were somewhat spread out tonight as Ethan cleaned up and took out 5 minutes on Josh Robertson who in turn took out 11 minutes on Wade Keet – Josh would have been a lot closer if it hadn’t been for the swimming at the start. Masters ladies had a torrid start with Monika Wohlgemuth, Patricia Kohrs and Maleen Hoekstra enduring wave after wave in the impact zone. But kudos to all, as they eventually cleared the backline and got on with the downwinding. Monika pipped Patricia and Maleen – great to see the effort put in by the real Masters! For the first time this season we also had a prone-paddler. Always young Dave Smith pulled out his old 10’6 lifesaving prone-board from the attic of his dads house to give the Dash a bash. Dave Smith has extensive lifesaving background which even extends to a stint in red speedos at Padang Padang in Bali Indonesia. He is also the current fastest guy on a surf-sup having set a time of 50.27 on a Naish Nalu 11’6 a couple of years back in a stonker. Despite these talents Dave only managed to record 1.18.12 which for his high standards must count as disappointing – Dave, however, cuts a larger than life figure and easily made up for lost time in the bar afterwards. Despite the sizey swell and nuclear winds all 35 paddlers completed the race – all with great smiles and tales of runs of the millenia…. Big thanks to our EPIC timekeeping team of Lollo, Jen and the Wild Timing guys for making the races run so smooth! Also a big thanks to our sponsors for all the great prizes. Results below and also available on the official PRIMI Naish Downwind Dash Series page.